There is some confusion as to the origin of this car, but one thing is certain: it is called Victor. It has electric power and it is also a highwheeler of American origin. There was a company in St. Louis which operated from 1907 to 1911 called the Victor Automobile Manufacturing Company and they specialized in highwheelers for the first two years of their existence. Coys mentions that this is the only Victor ever produced (there is even a tacky homemade plaque on the side of the car proclaiming this “fact”). They mention that the car could’ve been a one-off built in Nebraska, but that there isn’t any proof. I offer a third possibility: Victor of St. Louis built highwheelers in 1907 that used a two-stroke engine. Perhaps they experimented with an electric drivetrain on one? Who knows. At any rate, the electric system has been completely redone lately and this thing will do about 70 miles on a charge and tops out around 30 mph. It’s in the U.K. now, but it is available for purchase. It should sell for between $61,000-$88,500. Click here for more info and here for more from Coys in London. Update II: Sold, Historics at Brooklands, June 2016, $54,145. 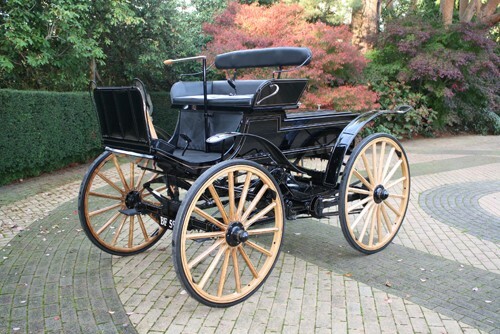 This entry was posted in Uncategorized and tagged 1907, auctions, cars, classic cars, coys, electric, highwheeler, runabout, victor by classiccarweekly. Bookmark the permalink.